Mussels, or moules, are the national dish of Belgium. They are traditionally served in a steamer pot with a side of Belgian frites and mayonnaise. You can find them on the menu at nearly every tourist restaurant in Brussels. In fact, as you walk down the alleyways near the Grand Place, you will see them featured on sandwich boards outside every café. Just in case you miss the signs, barkers stand outside each restaurant, beckoning you to take a seat. It looks much more romantic at night. These white-shirted, black-aproned hosts greet everyone who passes, stepping out onto the cobbled brick paths to block their way. They pull out a chair and persuasively usher you toward a white linen table as they point out “their” special: Moules & Frites 12.95 Euro. If you manage to get past one awning, the next French-speaking maître ‘d will do the same. And so on, and so on, down the street. Travel writers aren’t supposed to use the word charming, but it’s hard not to in this cozy, cobbled corner of Brussels. There’s something quintessentially romantic about it all. 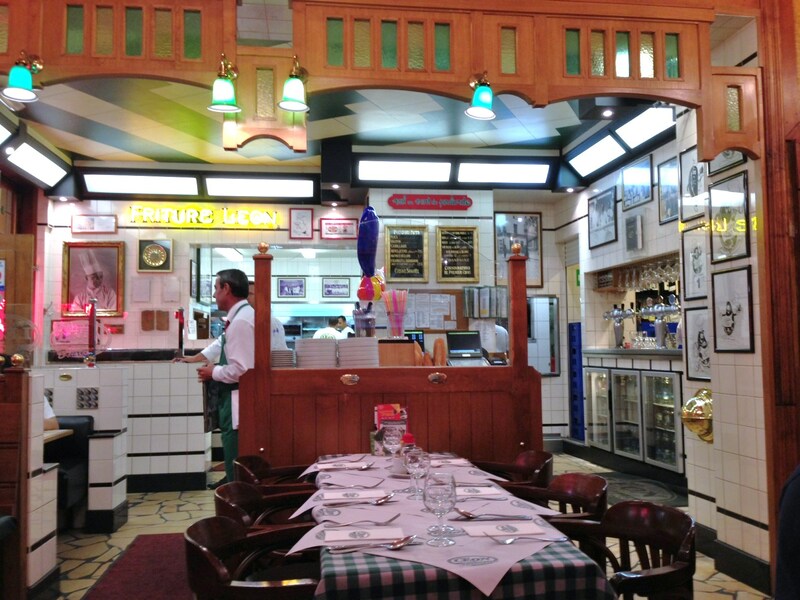 The narrow lanes, the French waiters, the romantic lighting and café atmosphere. Plus, the mussels. I do love mussels. I have dined in a few of these establishments and have not been that impressed with the food. These aren’t the type of places that depend on repeat business and one pot of moules is pretty much like the next. But there is one exception on the Rue de Bouchers. It is Chez Leon. They pull in their business by the quality of their food, not their high-pressure sales force. Chez Leon serves half a ton of mussels each day from just ONE restaurant. You can order them steamed, but I preferred mine open and had trouble choosing between Moules au gratin or Moules a’ la escargots. 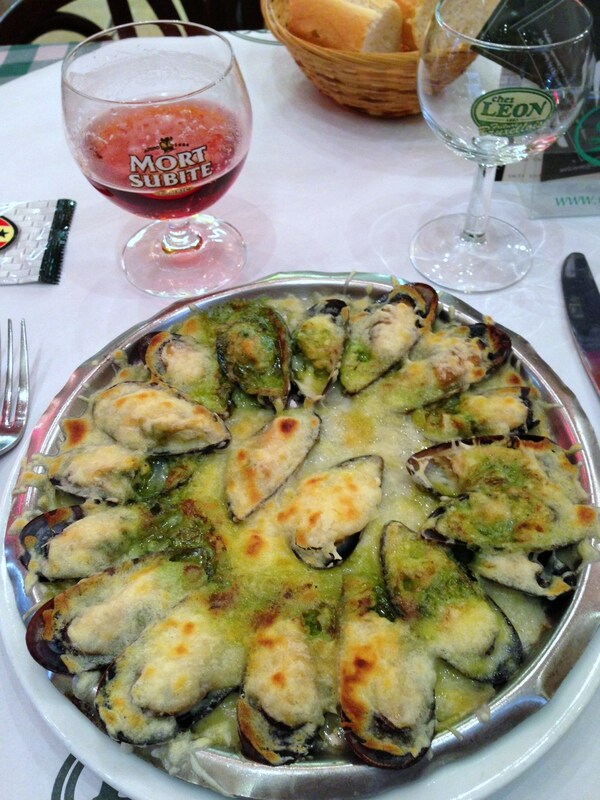 Luckily, there was something even better: Moules escargot gratinee. Or Mussels with snail butter and cheese. DELICIOUS! Naturally, I washed it down with a glass of Belgium’s famous cherry beer: Kriek. And then capped it off with another. 🙂 Leon’s brews its own special beer that they pair with their mussels, but when in Belgium, I always drink Kriek. It was my favorite meal in Brussels (aside from all the Belgian waffles I ate in the Grand Place). 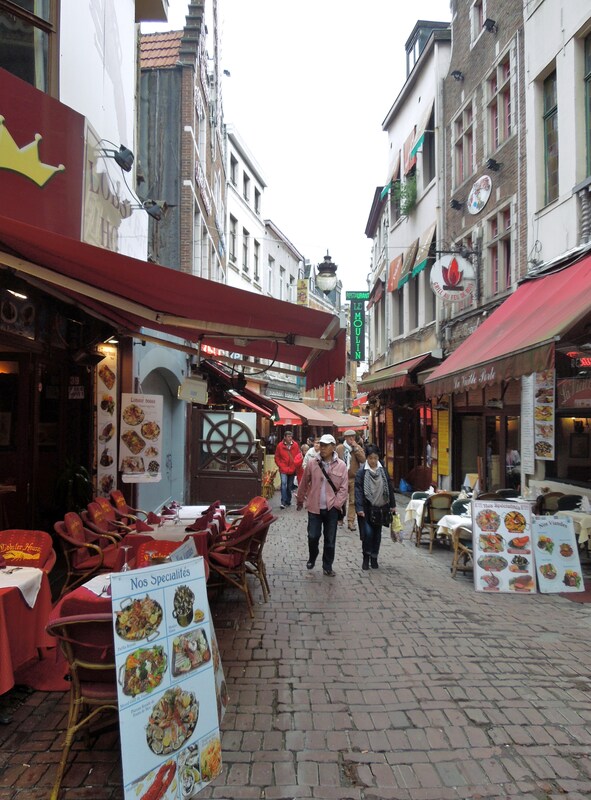 So, when in Brussels, definitely wander up and down the romantic cobbled-brick Rue de Bouchers. Take a seat at one of the enticing little café restaurants if you like. But if you want good mussels, stop at Chez Leon. The rest are just shells in a bucket. Which is more likely to lure you in? The food, or the atmosphere? Thanks for all of that intensive “research”. Amazing what we suffer through, isn’t it? I want that moules escargot gratinee NOW!! It’s amazing how many foods Brussels is known for. A person could go just to eat! It’s been ages since I’ve been to Brussels. Yum. The moules picture looks delicious. I’m usually lucky enough to go once a year on business. Hopefully that will continue. I always try to spend at least an extra day or two exploring. I love love steamed mussels swimming in white wine garlic broth, but am very much open to trying them open with the snail butter & cheese. Ufh! – it just sounds and looks so delicious! I unfortunately didn’t get to try Kriek when I was in Brussels a couple of years ago, but I might be able to find it here in New York. Dang, those mussels look to die for! And washing them all down with beer? You’re speaking my language, Juliann. And I need to head to Montreal!! Oh, this looks mouth watering! Fun post, Juliann. Thanks, Naomi. They taste even better than they look. Glad you enjoyed the mussels, but you must be a better bargain hunter than I am. Even around the Grand Place, the going rate seemed to be 22 euros — a bit rich for my budget. I settled for the carbonade flamande au biere brun, a hearty beef stew made with brown beer. And of course, the waffles, frites and beer. You make a good point, Paul. The 13 Euro price advertised is usually just a ploy to lure tourists in. Then they quote another price or explain that it’s only that price “if…” They prey on tourists. 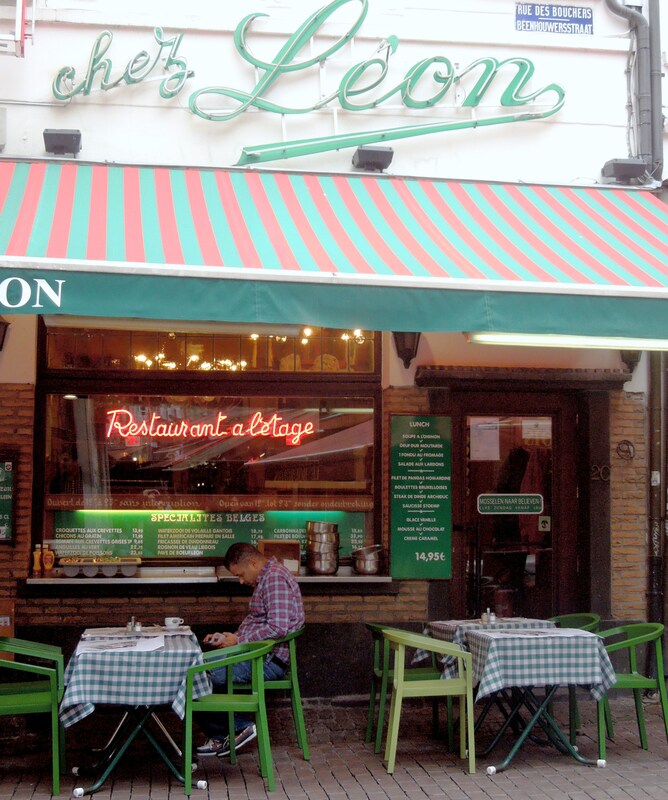 But the mussels I ordered at Chez Leon were only 17 Euro — a great price for a delicious meal. Moules and Frites are all very well (no, they’re great actually) but what about the Belgian COFFEE. Wow. I’ve heard that travel writers should never use the words “charming” or “quaint.” But rules are sometimes made to be broken. Belgian coffee? I’m missing something. Fill me in. I’m always in search of a good cup. It was so good I kept drinking it until I made myself vomit from caffeine overload. I’m not sure if that’s a winning endorsement in everyone’s eyes, but it’s how it happened. It’s so good. Comparable only to Vietnamese coffee, which I believe stems from the same french traditions. The coffee WAS very good there — not sure how it was different from other places in Europe, but it was the perfect accompaniment to those famous Belgian waffles. Now I’m kicking myself that I didn’t pay more attention. (Probably because I was too busy drinking Kriek.) Next time, I’ll notice. I can’t wait to go back! I didn’t notice, but I will next time! They look out of this world GOOD! Thanks for sharing this deliciousness! Gosh I miss those brussels-mussels! with frites! and a good belgian beer. A match made in heaven, really! OK – I”m there! Any place that has mussels as its national dish is on my list immediately! How did I not know this? Looks divine.